Father Harry E. McCreedy’s devotion to Our Lady of the Rosary of Fatima has him once again spreading the Blessed Virgin Mary’s message of peace and prayer to area Catholics on the 97th anniversary of her apparition in Portugal. “Our Lady asked us to pray the rosary daily and to offer prayers and sacrifices for the conversion of sinners, thus bringing about peace in the world,” Father McCreedy said. 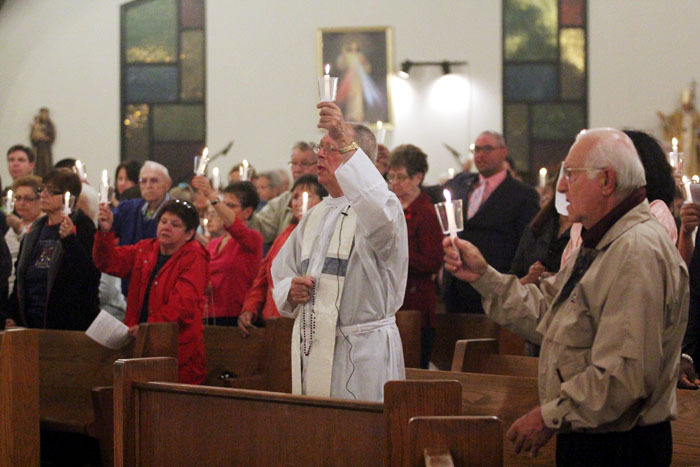 For the 19th year, Father McCreedy honored Our Lady of Fatima’s message at St. Paul Parish in East Norriton, where he is pastor and where parishioners prayed the rosary by candlelight Monday night, Oct. 13. The faithful who filled St. Paul Church commemorated the sixth and final apparition of Our Lady of Fatima to three shepherd children — siblings Jacinta and Francisco Marto and their cousin Lucia dos Santo. She appeared to them from May 13 to Oct. 13, 1917 in the Portuguese village of Fatima. Father McCreedy said hosting the vigil each year is important as he sees there’s a “lack of peace within communities and inner self” at a time when only a third of Catholics go to church regularly. “It’s a call for reparation to the Eucharist Heart of Jesus,” he said. Outside St. Paul Church, there’s a shrine of Our Lady of Fatima with statues of the three children kneeling before her. During the October 1917 apparition, Mary came before tens of thousands of people, some who didn’t believe that Our Lady of Fatima appeared to the children in the previous months. There in a field, people witnessed the famous “Miracle of the Sun” — it had been raining during the apparition when suddenly the sun came out “spinning” and shone in different light patterns, leaving people’s clothes dry, according to witnesses interviewed by newspapers. At the same apparition, the Mary asked for a shrine to be built for her and for the rosary be prayed daily. 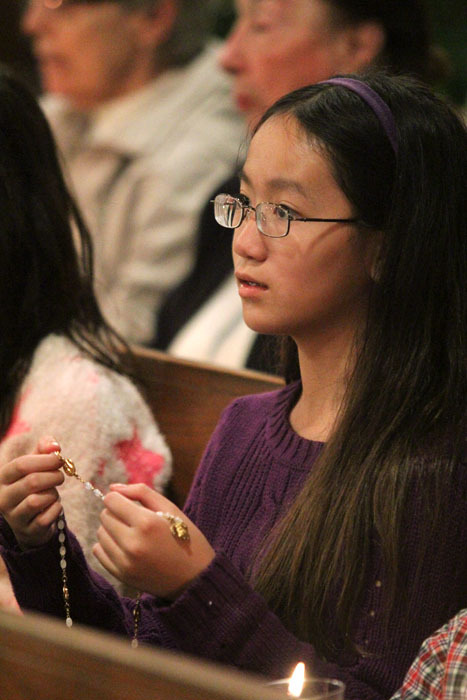 She identified herself saying, “I am the Lady of the Rosary,” Father McCreedy said. St. Paul parishioner Margaret McCabe, a Fatima devotee, said she prays the rosary daily. She has several rosaries, but on Monday she had an extra special one. Father McCreedy had given her a rosary several months ago from the Shrine of Our Lady of Fatima in Portugal, which she saved for Monday’s prayer. “This one has the three children represented,” said McCabe, a strong believer in the power of the rosary. Fatima’s message is more important than ever, she said. At 79 years old, McCabe worries about the state of the world and how it will be when she dies. During Monday’s vigil, there was veneration of the Pilgrim Virgin statue and acts of entrustment of families and the country to the Immaculate Heart of Mary. “It was during the June apparition that Our Lady revealed her Immaculate Heart, promising that her heart would be our ‘safe refuge and lead us to God,’” Father McCreedy said. For parishioner Debbie Arnone, the annual event is a “little piece of Fatima,” the shrine in Portugal. The praying of the rosary each Oct. 13 brings peace to her mind and at least for one day the prayers can help to bring peace as “Our Lady of Fatima wanted us to do,” Arnone said.